These doughnuts look suspiciously normal. In the hopes of encouraging more folks to go vegan, Sam Kang turned to doughnuts. He ran a plant-based Vietnamese restaurant in Sunnyvale for eight years before getting burnt out. After a short break, he figured vegan-izing one of the most common American comfort foods would do wonders for converting the masses. Enter Vegan Donut Gelato (411 E 18th St.), which softly opened earlier this month just east of Lake Merritt. It’s Kang’s second location — his first vegan doughnut shop launched in Modesto last December. Rapid expansion wasn’t and still isn’t his primary goal, though. “When we opened in Modesto, a lot of people came from Oakland and asked us to open,” Kang said. He thinks Oakland’s central location will help him reach the vegan community across the Bay Area. But vegans aren’t actually his prime demographic — he’s hoping to feed the masses. The place does feel like your standard, no-frills doughnut shop. The display cases are stocked with all the usual suspects: raised, cake, holes, twists, fritters, and more, with a healthy dose of chocolate glaze and rainbow sprinkles. 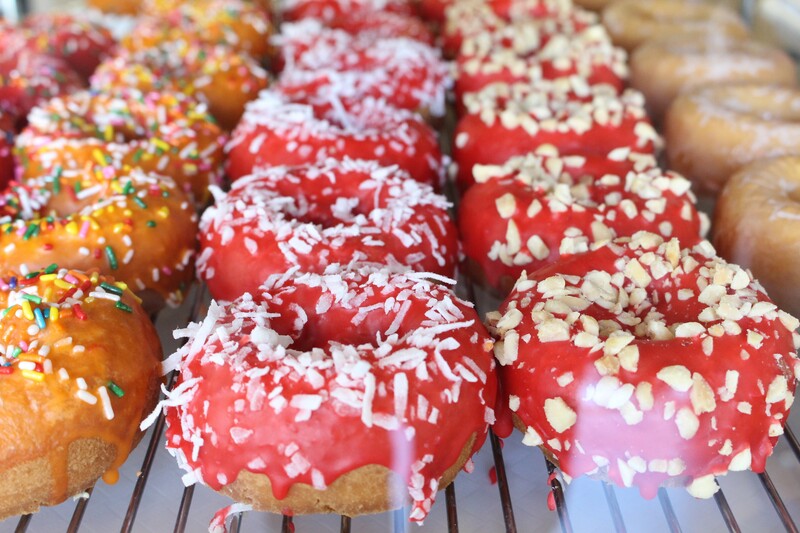 It’s stands in stark contrast to Pepples Donut Farm, Oakland’s only other all-vegan doughnut purveyor, which focuses primarily on cake doughnuts in unusual flavors like green tea or kaffir lime. The price point at Vegan Donut Gelato is also slightly lower: raised and cake doughnuts go for $2, and maple bars hit $2.50, for example. Kang wouldn’t reveal the secret to his doughnuts, only vetoing my guesses at alt-milks, flax seeds, garbanzo beans, and egg replacers. I sampled a single raised doughnut hole and found it not quite as airy and soft as non-vegan recipes but pretty darn close. The gelato will be made in-house with an almond milk base, but the machine hasn’t arrived yet. It’s coming from Florida, and with Hurricane Irma, Kang isn’t sure when it’ll make its way here. Plant-based living wasn’t always so important to Kang, but he’s from Indonesia, where folks tend to eat vegetable-focused meals with small amounts of meat and lots of tempeh — quite different from the typical American diet. He’s been vegan for the last 25 years and hopes to convince more people to join him. Vegan Donut Gelato, 411 E 18th St., Oakland, VeganDonutGelato.com.